Is the Fall/Winter Surf Apparel segment as strong as its Spring/Summer counterpart? Being a surf lifestyle brand spring /summer is always going to be a strong part of our business. In saying this, we are focused on building a strong winter component to ensure we are considered a year-round brand for retailers. Our aim is to design fall/winter garments that suit our brand’s values and direction offering something unique to the market. Which are the main competitors for FW Surf Apparel: outdoor, snow brands, fast fashion stores, your own snow outerwear collections? Fast fashion for those who want to be on trend and are on budget. Outdoors for those who want technical garments and are willing to pay a little more. Selective distribution: how do you split your offer in between various distribution channels? Per definition, Rhythm as a brand has a selective distribution per sector with exclusiveness in certain cities. We want to open quality doors and not just quantity. In terms of product, we do not have a selective distribution strategy for now. If we would decide to go this way in the future, we would more look into SMUs than splitting up the main collections between retailers. Please detail the collections’ stories among your FW range. Rhythm takes a lot of inspiration on vintage pieces re-worked into contemporary garments. You will find a good blend of this in our new collection. What are the colour palettes for men’s FW19/20 season? We always stay true to an organic color palette, this season you will find a blend or ochres, clays, burnt yellows and worn indigos amidst our staple colours. Which are the key prints and patterns? Vintage-inspired florals, paisley’s and stripes are key to a Rhythm collection. We have also introduced some nostalgic vintage surf prints as an ode to our surf heritage. Which fabrics and materials will be the greatest hits for FW19/20? 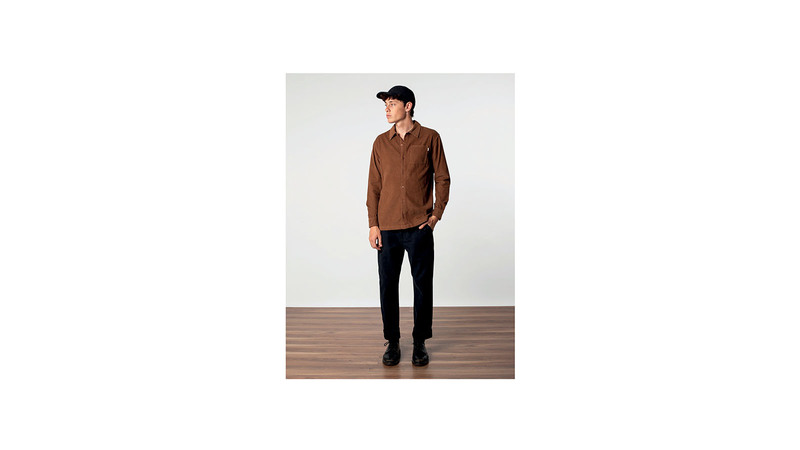 There are some corduroy and wool blend garments in the collection that are getting a great response in-house. You can’t go wrong with a thick wale cord during fall. How much is the “outdoorsy” Cold Water Surfing Apparel inspired by your outerwear range (fabrics, constructions…)? We have a portion of the outerwear that is inspired by outdoor living and the other half is more inspired by vintage surf fashion. Most the outdoor styles feature matte nylon fabrication to offer technical values while still giving a vintage and worn look. Element proof clothing equals expensive?